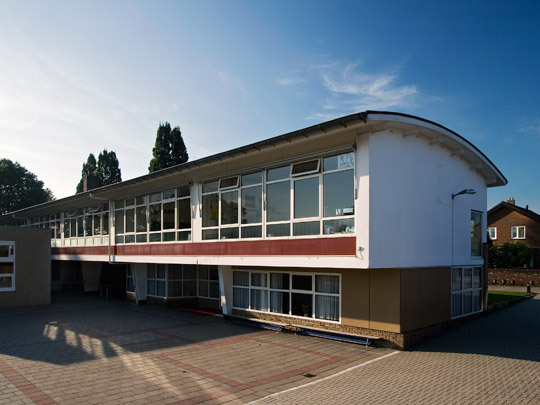 This is one of the few school buildings to deviate from the usual post-war standard type. Classrooms in a linear sequence combine into an elongated volume floating above ground level. The access corridor is not on this level, however, but on the ground floor beneath the classroom block. Each classroom is reached individually by a series of stairs in a narrow transparent zone at the rear of the block. Toilets, storerooms and a staffroom form a separate volume tucked beneath the main block. An extension added recently could be slotted with ease into this configuration.